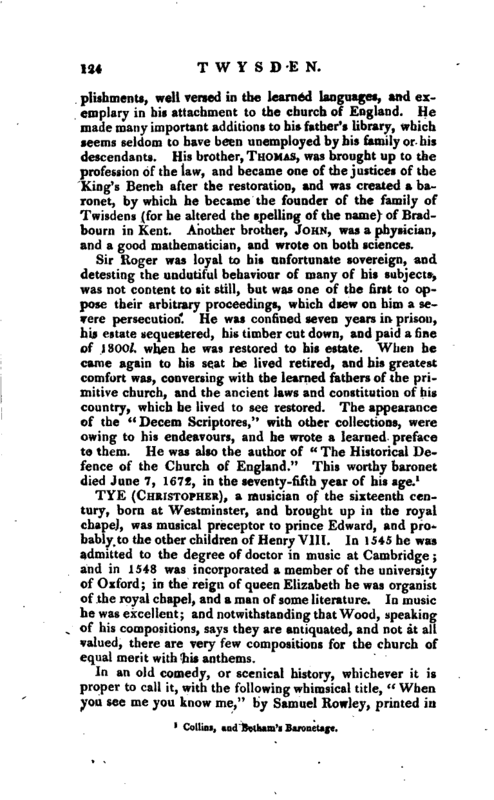 , a musician of the sixteenth cen-, tury, born at Westminster, and brought up in the royal chapel, was musical preceptor to prince Edward, and probably to the other children of Henry VIII. In 1545 he was admitted to the degree of doctor in music at Cambridge and in 1548 was incorporated a member of the university of Oxford; in the reign of queen Elizabeth he was organist oithe royal chapel, and a man of some literature. In music he was excellent; and notwithstanding that Wood, speaking of his compositions, says they are antiquated, and not at all valued, there are very few compositions for the church of equal merit with his anthems. In an old comedy, or scenical history, whichever it is proper to call it, with the following whimsical title, “When you see me you know me,” by Samuel Rowley, printed in | 1623, wherein are represented in the manner of a drama some of the remarkable events during the reign of Henry VIII. 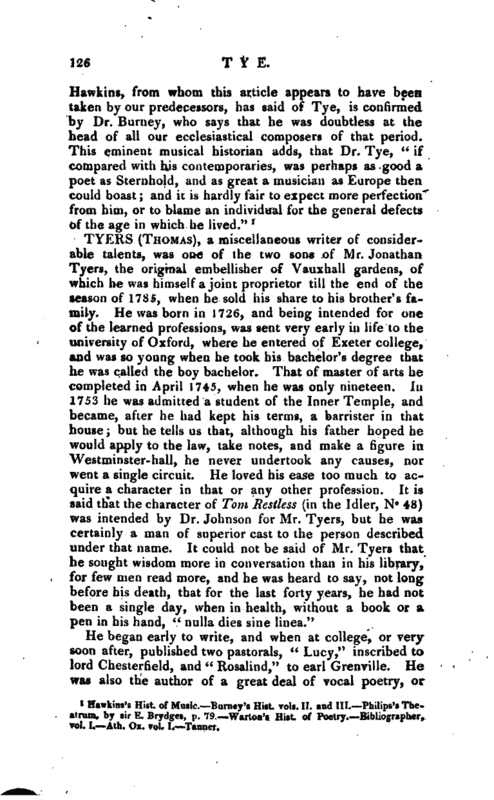 is a conversation between prince Edward and Dr. Tye on the subject of music, which, for its curiosity, sir John Hawkins has transcribed at length. 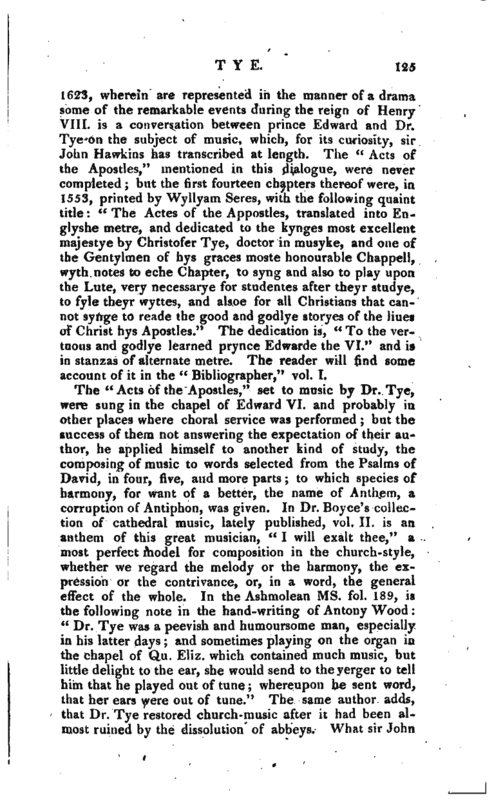 The “Acts of the Apostles,” mentioned in this dialogue, were never completed; but the first fourteen chapters thereof were, in 1553, printed by Wyllyam Seres, with the following quaint title: “The Actes of the Appostles, translated into Englyshe metre, and dedicated to the kynges most excellent majestye by Christofer Tye, doctor in musyke, and one of the Gentylmen of hys graces moste honourable Chappell, wyth notes to eche Chapter, to syng and also to play upon, the Lute, very necessarye for studentes after theyr studye, to fyle theyr wyttes, and alsoe for all Christians that cannot synge to reade the good and godlye storyes of the Hues of Christ hys Apostles.” The dedication is, “To the vertuous and godlye learned prynce Edwarde the VI.” and is in stanzas of alternate metre. The reader will find some account of it in the “Bibliographer,” vol. I.
Hawkins’s Hist, of Music. Barney’s Hist. vols. II. and III. Philips’s Theatrum, by sir E. Brydges, p. 79. Warton’s Hist, of Poetry. Bibliographer, vol. I. —Ath. Ox. vol. I. Tanner.